In 2010 I visited Vienna. As part of my scholarship "Trainworkers - in the footsteps of nocturnal shadows" of the Cultural Foundation of Saxony, I made contact with trainwriters from Vienna. I accompanied them during their nightly activities and photographically documented these experiences. From the documents emerged a series of drawings and screen prints, which have been shown in Amsterdam, Berlin and Dresden. In 2018 I return to Vienna. Before arriving in Vienna, I will draw numerous drawings about expectation, which serve as the basis for his stay in Vienna. Once I arrive in Vienna I will discover the public space of the Danube metropolis day and night. 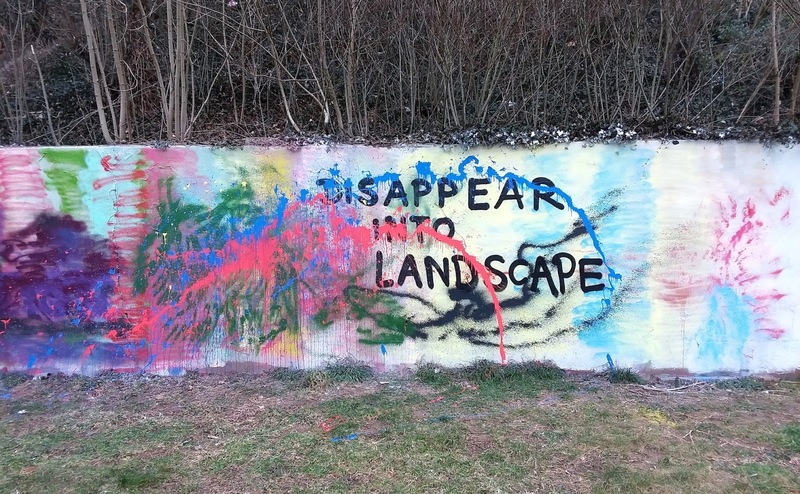 I will search for places - for visible and hidden works. Of each work I take a part with me. 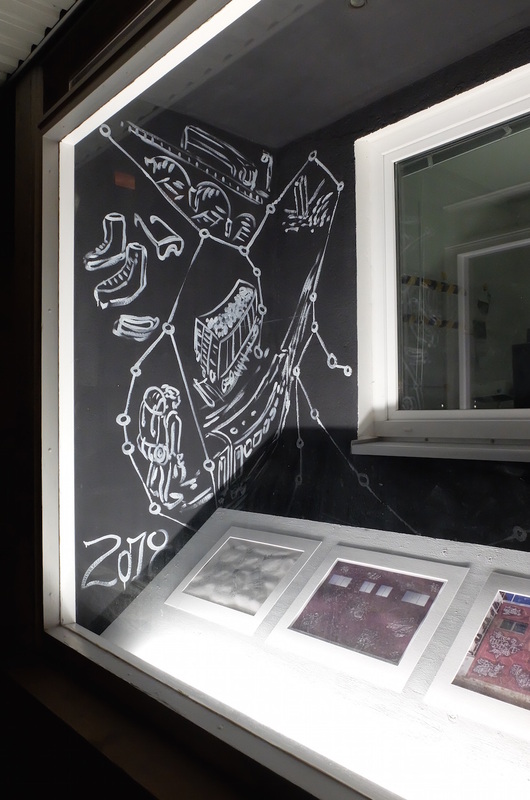 Out of expectation drawings and fragments of works I will create a new egozin. The Egozin will be printed live during the opening at Oxymoron Gallery and will be available there and after. 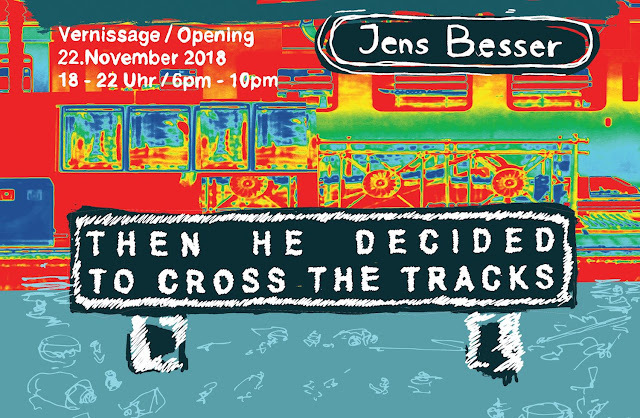 On the 22nd of November, the solo exhibition "Then He Decided To Cross The Tracks " opens at Oxymoron Gallery. The 37. Dresdner Graphikmarkt 2018 will take place on 10th November (10am - 6pm) and on 11th November (10am -4pm). Venue is also this year the conference center in the German Hygiene Museum Dresden. Displayed and offered for sale are prints, drawings, watercolors, collages, photographs and other works on paper by almost 100 artists. Der 37. Dresdner Graphikmarkt 2018 findet am 10. November (10-18 Uhr) und am 11. November (10-16 Uhr) statt. Veranstaltungsort ist auch in diesem Jahr das Konferenzzentrum im Deutschen Hygiene-Museum Dresden. Gezeigt und zum Kauf angeboten werden Druckgraphiken, Zeichnungen, Aquarelle, Collagen, Fotografien und andere Arbeiten auf Papier von knapp 100 Künstlerinnen und Künstlern. Darunter auch ältere und neue Siebdrucke von mir - u.a. "Transwaggon" (2017), "In memory of Rudolf Sitte"(2009) und meine neuen "Egozins"(2018)! 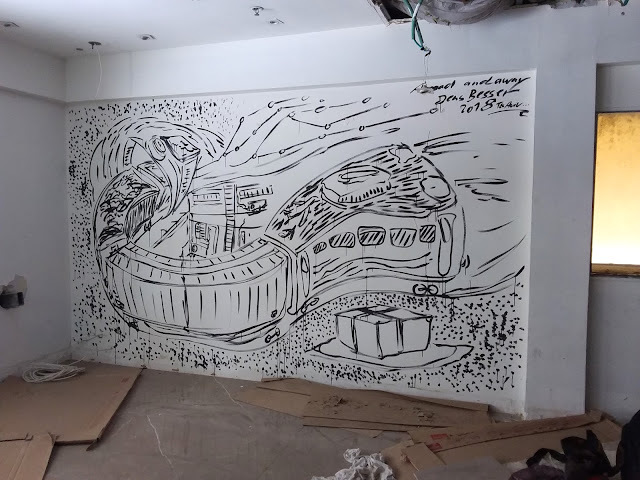 In 2013 me and the Bulgarian Urban Artist Valeri Gyurov (GIFTED:) realized with partners from all over Bulgaria a tour with a moveable screen printing studio. We introduced a large group of people to the technique of Do It Yourself screen printing. Thanks to the support of Goethe Institut Sofia workshops have been hold for free in Burgas, Pleven, Plovdiv, Ruse, Shumen and Sofia. During this period I introduced Nadezhda Georgieva and she got so inspired, that one year after, she founded Sito Studio. Today Sito Studio is well known in the Bulgarian illustration and urban art world for their well done prints and contemporary illustrations. Sito Studio was the first place of it’s kind and for four years teached over 250 people in the technique. Nadezhda Georgieva would like to share with you the future plans for the studio and the story behind. She will also show some of her recent drawstring bags, t-shirts, prints and give you a sparkle about independent working and creating your own art products. 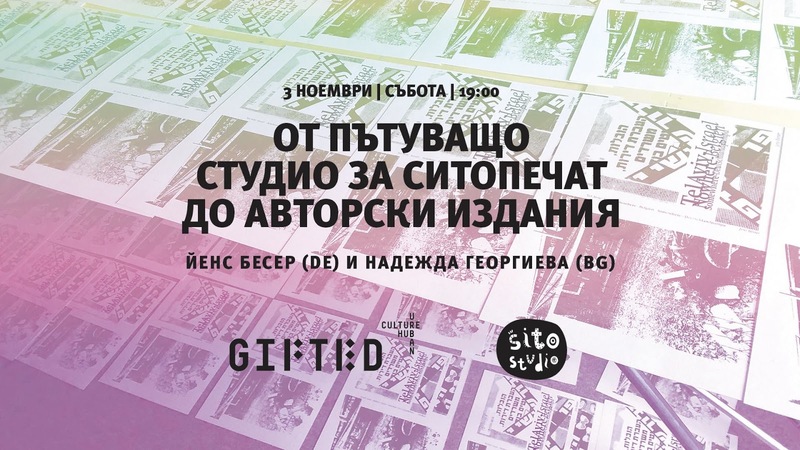 I will talk about the „2013 - Screen Printing Bulgaria tour“, my printed works after my stay in Bulgaria and of course about recently printed works - hand printed Egozines. For my Egozines i used spray painted papers from visited places around the world and folded those papers to DIY Egozines. 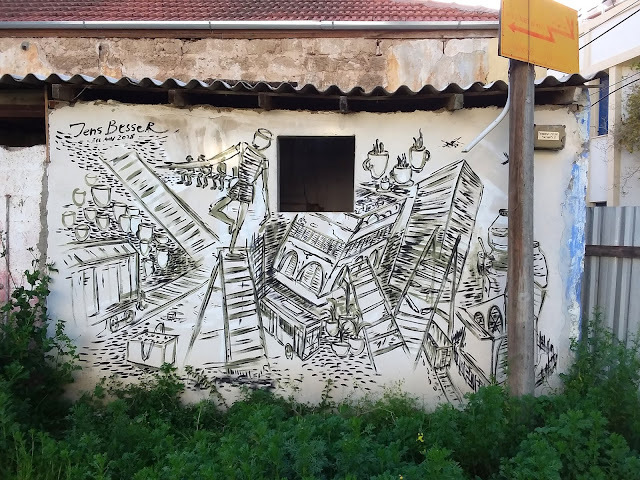 After the presentation we will print live new works on papers painted in Bulgaria. The fresh prints will be directly for sale. The talk will be hold in English ! When? 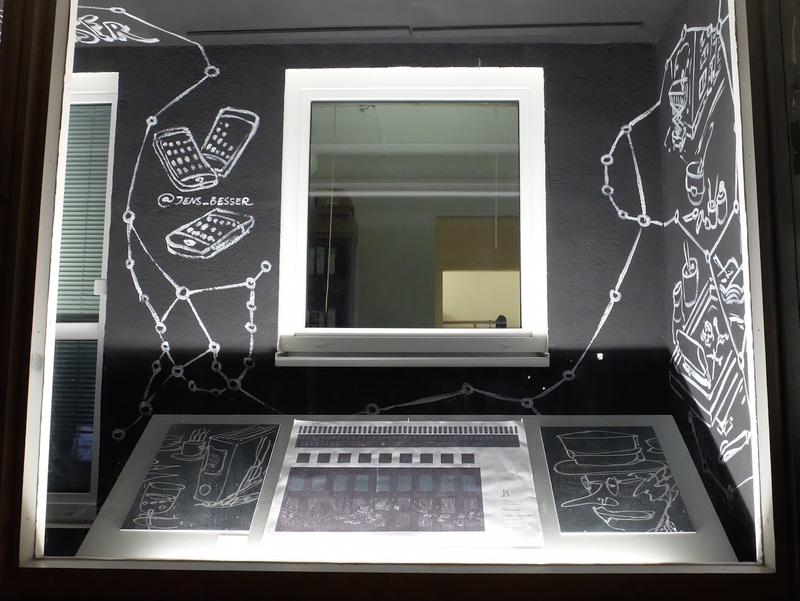 Saturday, 3rd November - 7 p.m.
1st of September 2019 RASTERN show opened in Dresden. 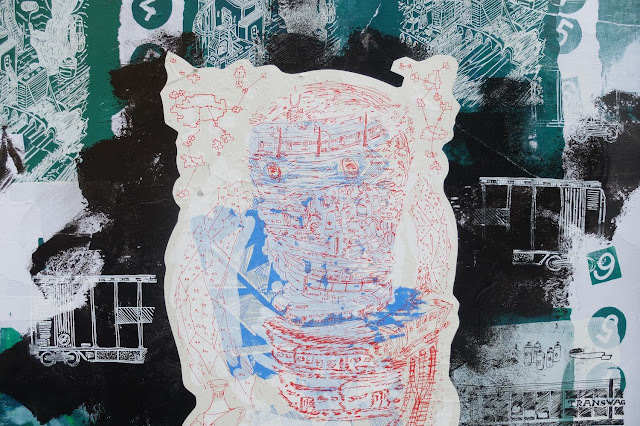 RASTERN is the first show about the history of Silk Screen Pinting in Dresden curated by Claudia „Wanda“ Reichardt at the Leonhardi Museum Dresden. For the show i produced a silk screen work called „The Infinite Freight Train“ done on the outside windows of the museum. 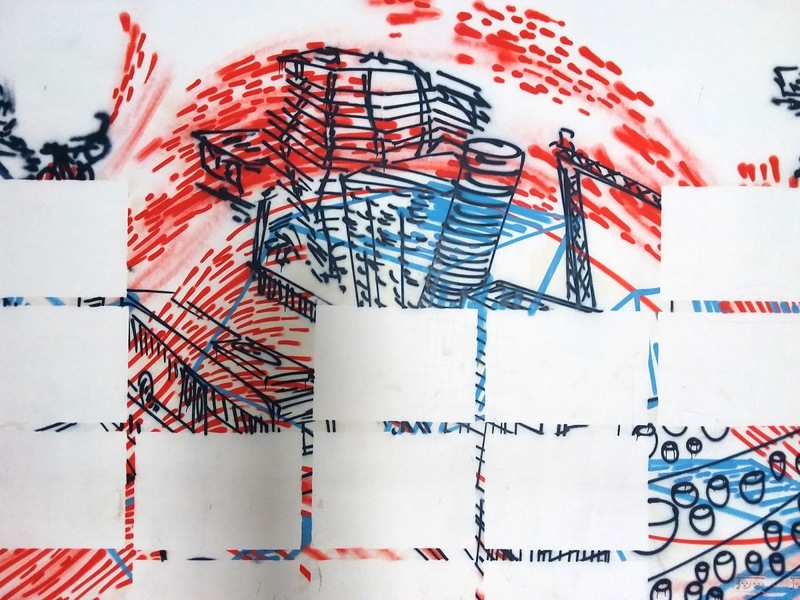 This work is printed with special screens and done in a single color. You can see more details on my fresh Insta-Profile, but to see it in real is always best. My second piece at the show is showing the work „Don’t believe the hype“ from 2017. This work is visible outside, too. It’s pasted on an artificial door which is completely covered by prints. 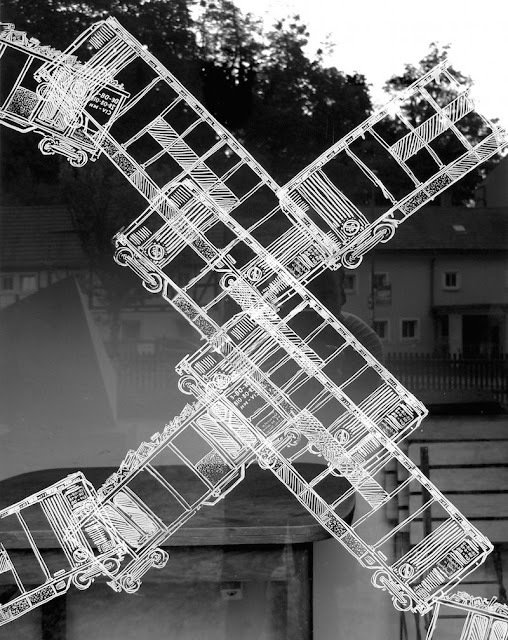 Inside the show you can find another work - the illustration poster for „FreightTrainWorks“ - show in Dresden & Görlitz.In the show you can also find a lot of well known artist of different ages such as Karl Heinz Adler, Stefanie Busch, Herrmann Glöckner, Carsten Nicolai, A.R. Penck or Holger Stark. 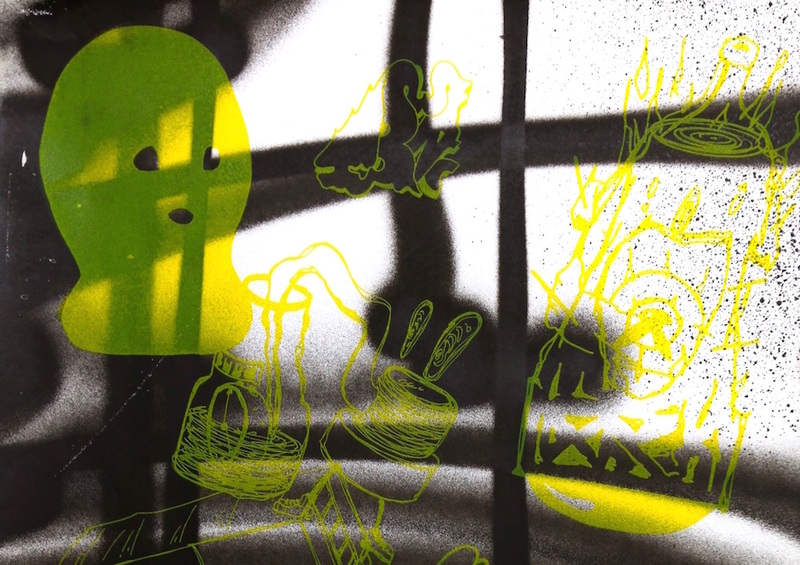 In November I offer a screen print course at riesa efau called „Plakastrophe!“. If you are interested in the technique & political Posters you should join this workshop. 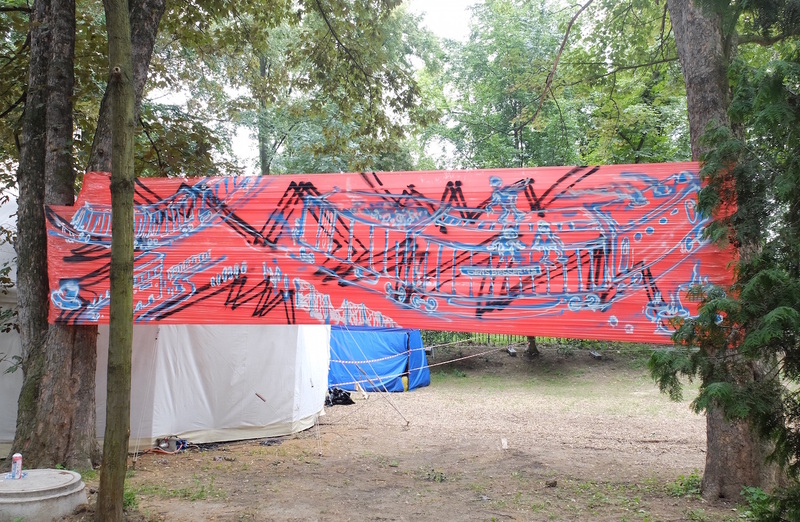 For Metronome Festival Prague 2018 i did a series of works in different locations. 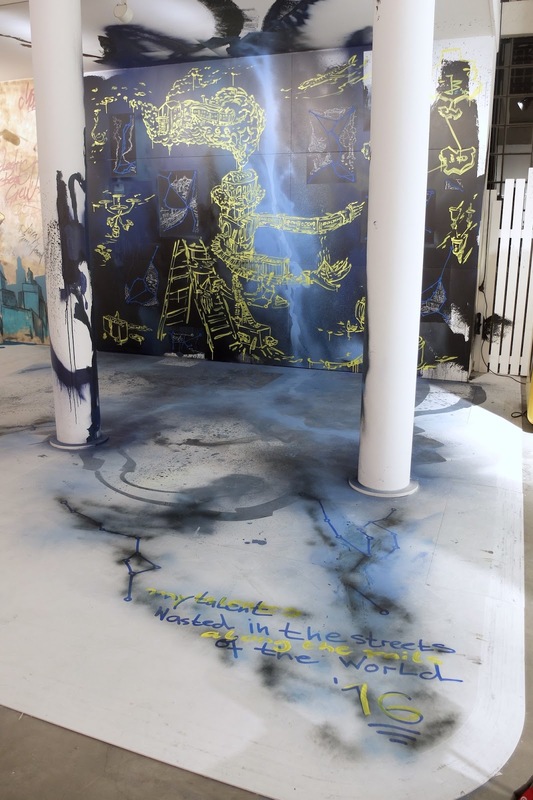 Two Spaces had been prepared with large banner to paint - both dealed with „Train Of Infinity“ Theme. 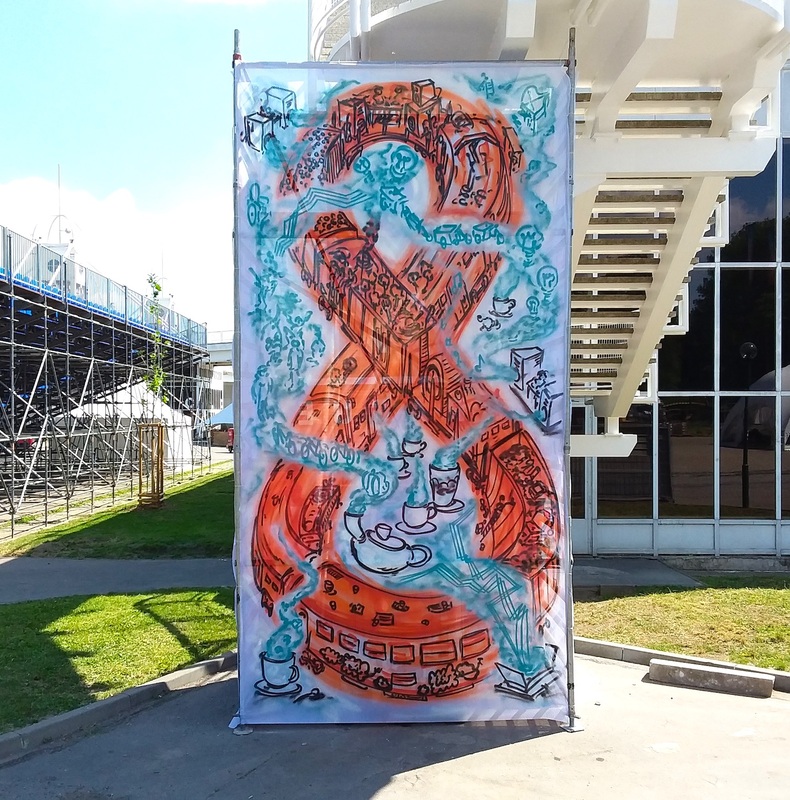 For the so called „Street Art District“ i did different types of wraps - Panorama360degrees, HighStretchWrapping and different color combinations. 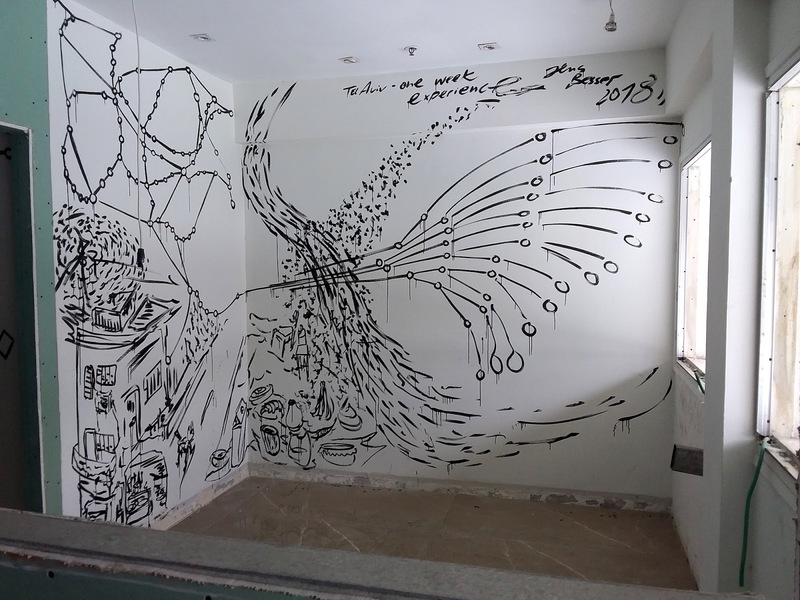 Some of the works have been done live during festival day programme. Thanx a lot to the festival team especially Barbora , Ondrej and Inka for helping ! It was a pleasure being invited. Everything was well prepared and I enjoyed working there. The line up of metronome prague festival 2018 was great ! Some of my favorite music groups played there and I got nice impressions from Czech music goups. From 22.-23. 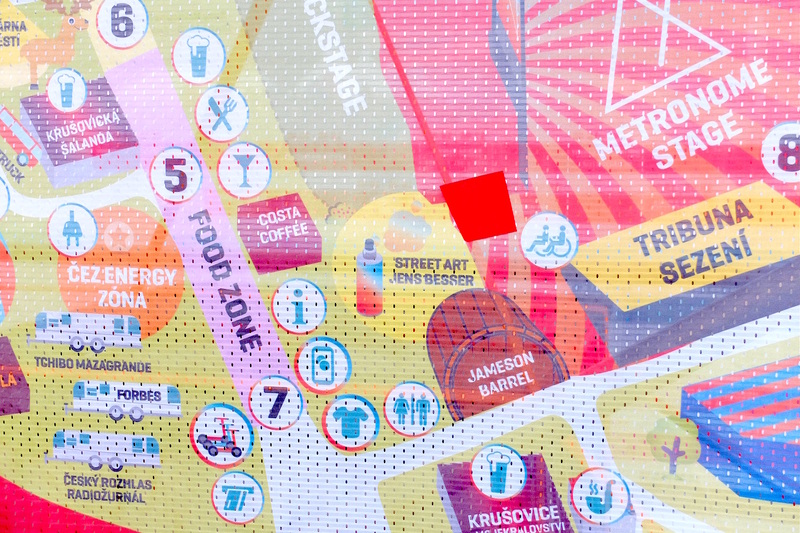 June I m invited to Metronome Festival Prague to realize temporary interventions at the festival area and to be part of a discussion about art in public space. 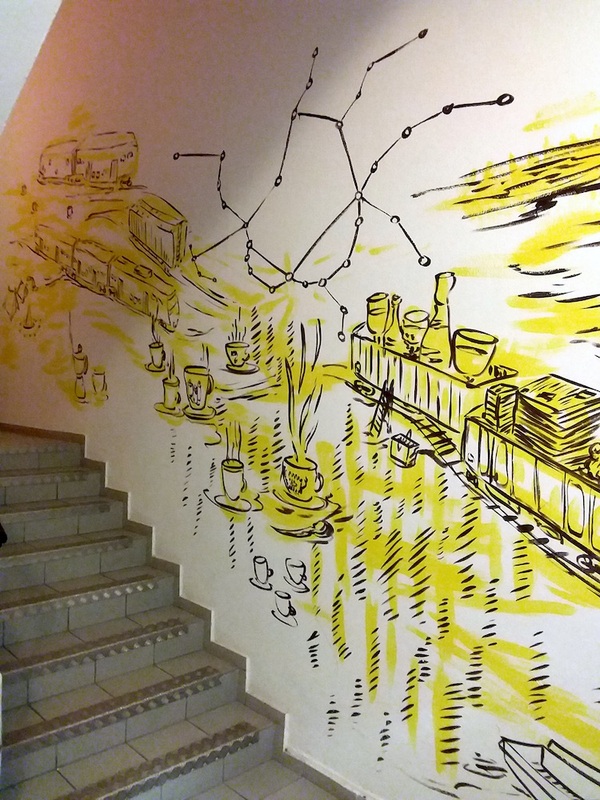 During my stay in Kassel I realized an inside mural for Sanderhaus - travelling and moka again. 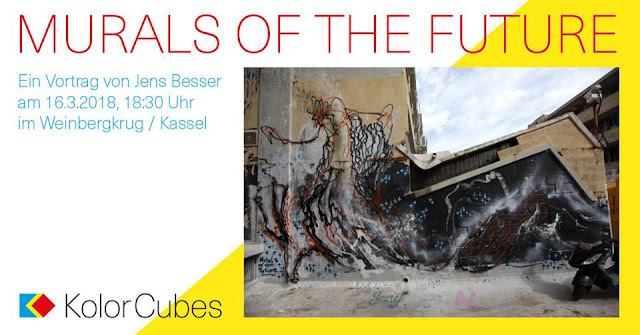 Thanx again to Gerrit of Kolorcubes project in Kassel. Ghettoresidency continues in 2018. 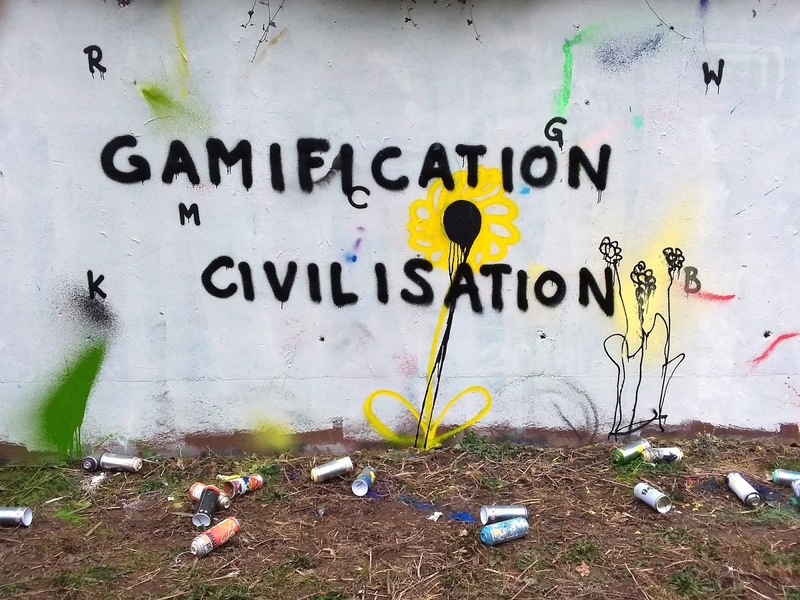 And because it's important to announce where it is I did a fresh new decoration of Ghettoresidencys public displays. 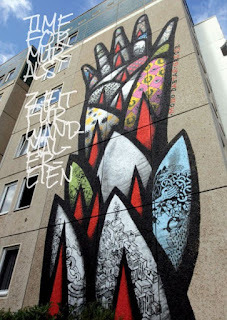 Check it out in Dresden - Braunsdorfer Str. 23/25 (backyard/garden side). 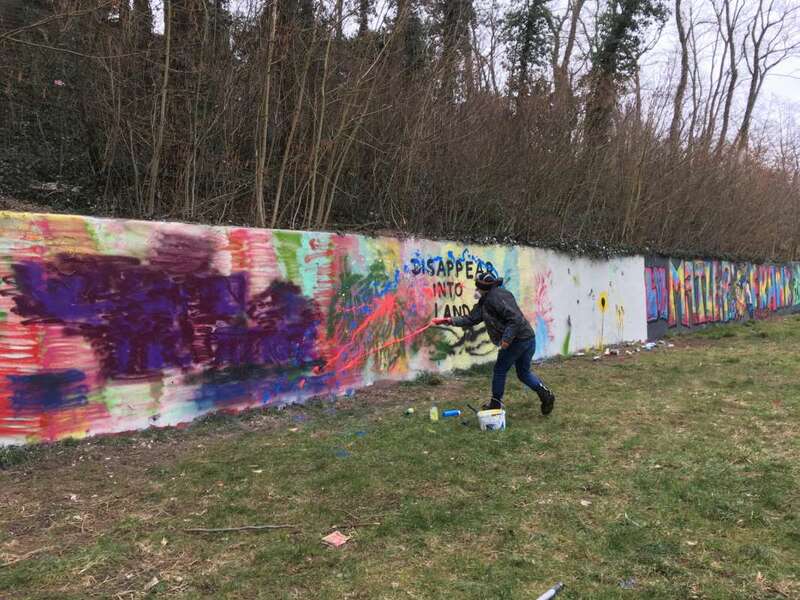 Thanx to the Kolorcubes Mural Project i did a performance during arctic temperatures with hot tea, coffee and a loooot of colors ! 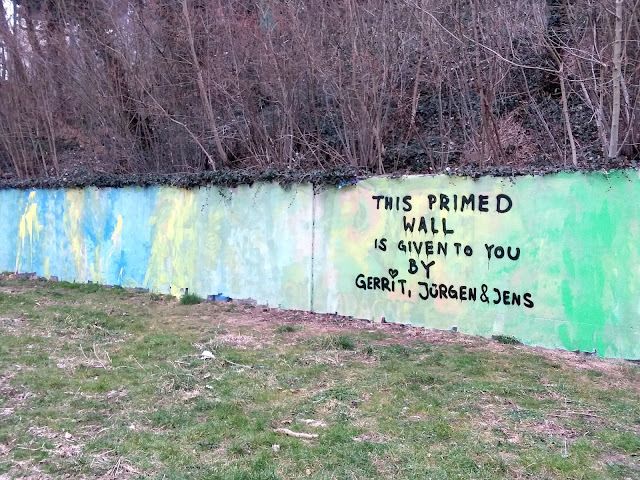 This performance session took place at a wall near Kassel University. 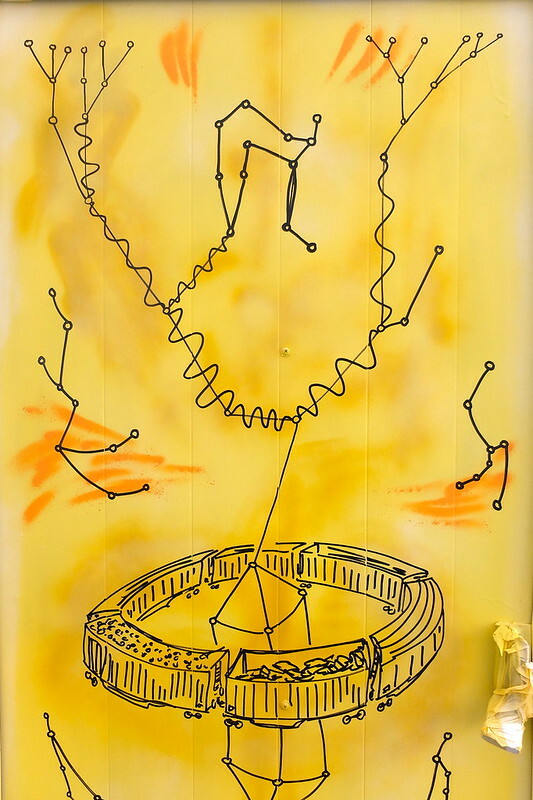 Thanx a lot to Gerrit R.
Friday 16th March i hold a lecture in Kassel about my works of past, present and future. In the lecture i explain my development of murals from unauthorized works to official performances such as the Murals Of The Future-series together with Stefan Schwarzer. When? Friday, 16th March 2018 - 6.30 p.m. In October 2017 I participated in the German/Czech project "Urban Nad Labem". "Urban Nad Labem" was organized by LackStreicheKleber e.V. from Dresden/DE. During two weekends I realized collaborations with czech artists - Michal Skapa from Prague and Aneta Bendakova from Decin. 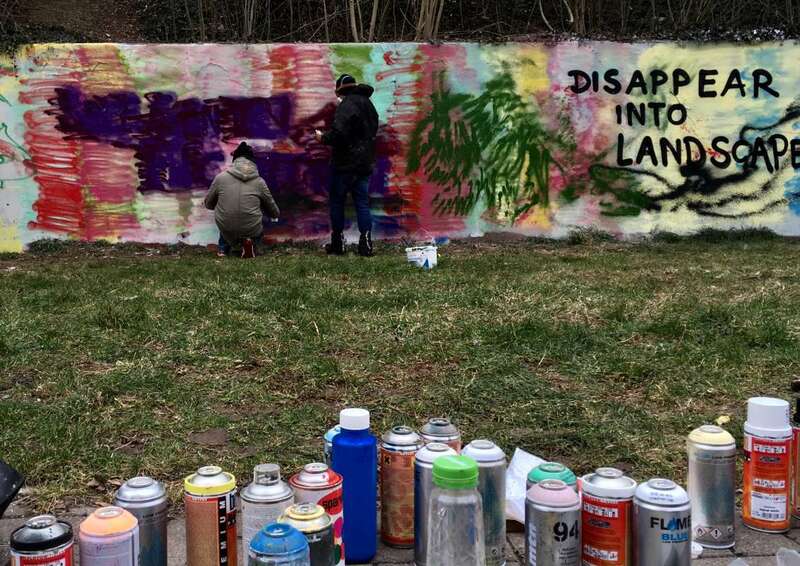 Thanks to local art associations and groups we did three public works in different areas of Usti Nad Labem. Thanks a lot to Deska, In Vitro and Hranicar Usti Nad Labem. "Bügelfeuer" is a show organized by train fans from Bremen at "Spedition Bremen". In this show you can find a variety of works and talks in connection to the topic of TRAINS. Hoboing, surfing , painting, writing and spotting - lots of different activities on and with trains. I'm invited to present PADiGLiONE iN MOViMENTO publication and to exhibit some of my recent works. Stay tuned about the upcoming show in Bremen - more Infos here. A new fresh silkscreen print of mine is now available. 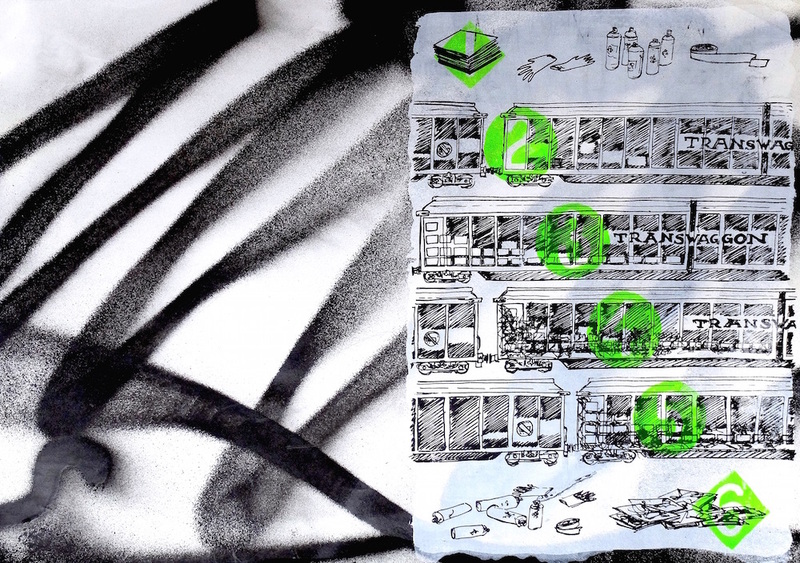 Transwaggon Paper Panel is a silk screen print edition done with spray paint and acrylique on paper. All pieces are signed and numbered on backside. 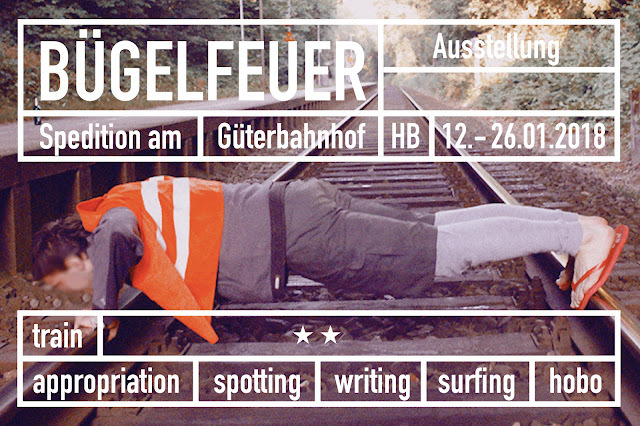 During the next weekend I take part at the 36th Dresdner Graphikmarkt. Besides presenting my own works for selling I print live during both days of the market. 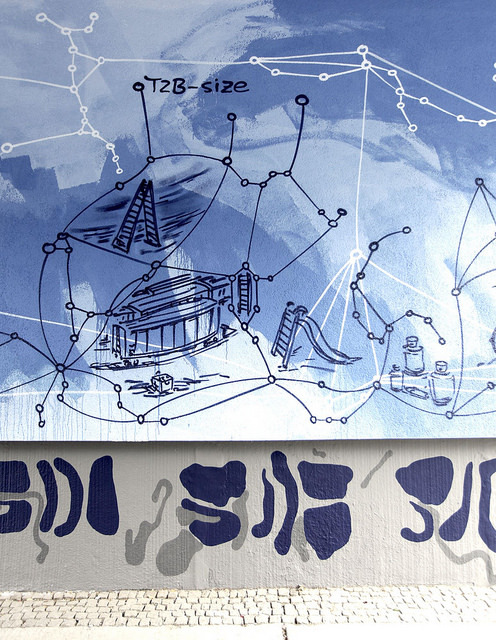 You can follow the development of a new screenprint series - See you there! You can find more Information about the Dresdner Grafikmarkt on their website. Am nächsten Wochenende werde ich am 36. Dresdner Graphikmarkt teilnehmen. Neben der Verkaufspräsentation meiner Werke werde ich auch Vor-Ort drucken. Ihr könnt also live miterleben wie sich eine neue Siebdruckserie entwickelt - Wir sehens uns auf dem Grafikmarkt! Weiter Informationen zum Dresdner Grafikmarkt sind zu finden auf der Website des Markts. Urban art bicycle tour through street art and mural history of Dresden "Fröbtau"
Fröbtau unites the Dresden dirstricts of Friedrichstadt and Löbtau. 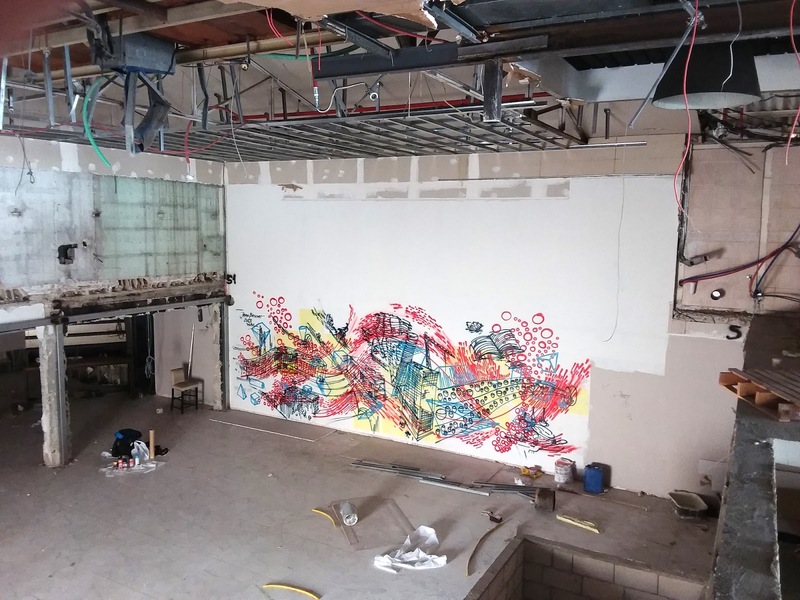 Fröbtau - that means unauthorized graffitis at abandoned factories in the 90’s, illegal urban art shows in empty residential houses and street art posters by the group NOLOGO in 2000’s. 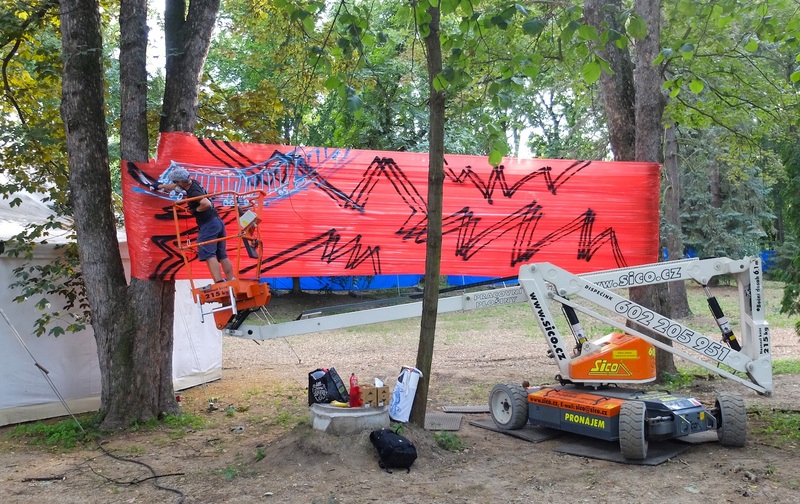 Fröbtau - that means official large sized murals of the project „RAUM City Bilder“ from 2011-2014, the Sichtbetong - Camp 2013 or since 2016 the Roads Festival. Since 1989 the appearance of Fröbtau changed intensively. 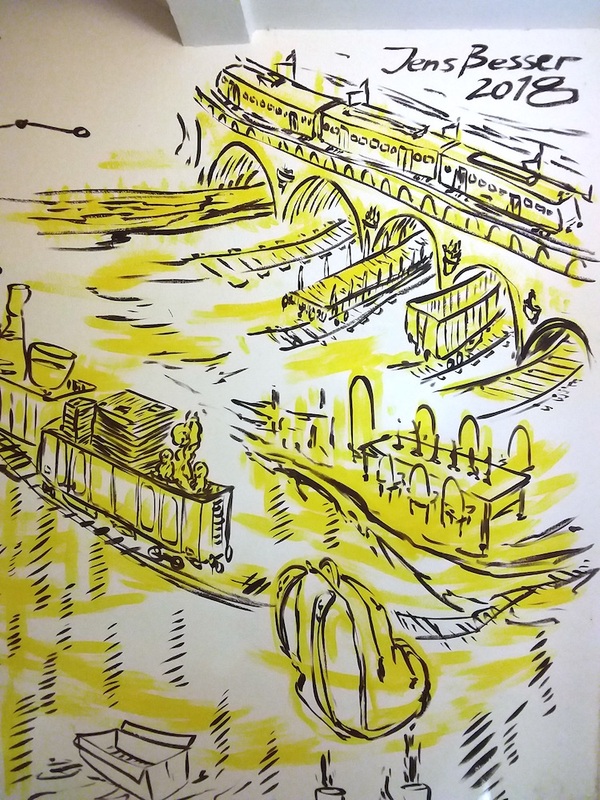 Contributions of local actors like riesa efau, Friedrichstadtzentral e.V., konglomerat e.V. or Jens Besser lead to diverse alternative life in the districts of Friedrichstadt and Löbtau. Jens Besser operates globally as muralist. In the 90’s he already started his activities in urban design in Fröbtau. 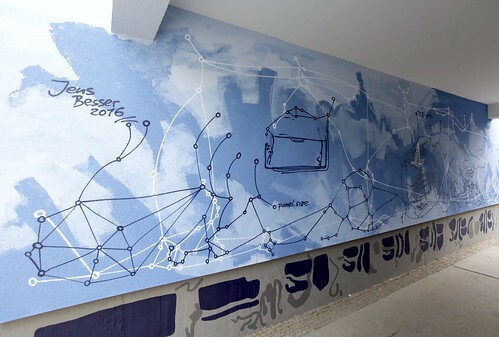 Later Besser invited international artists in projects at Motorenhalle e.g. 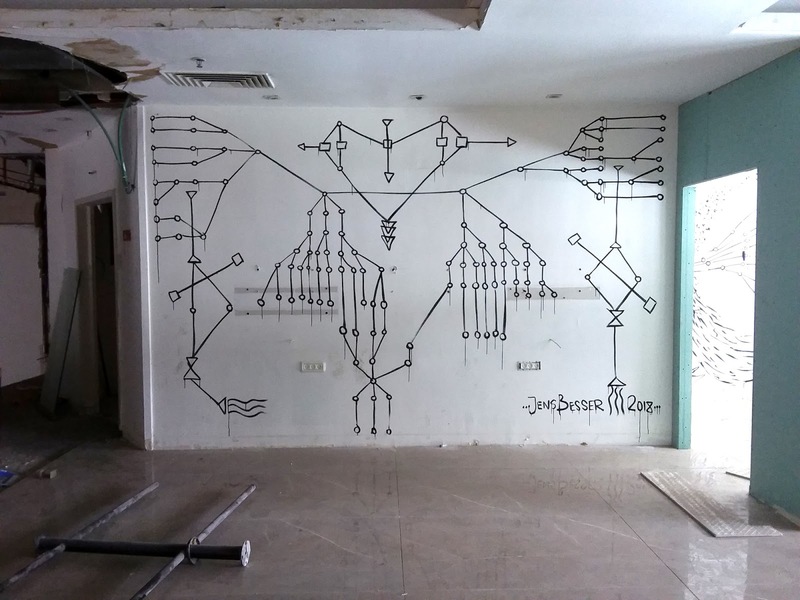 „Muralismo Morte“ or „Conceptual Vandalism“. 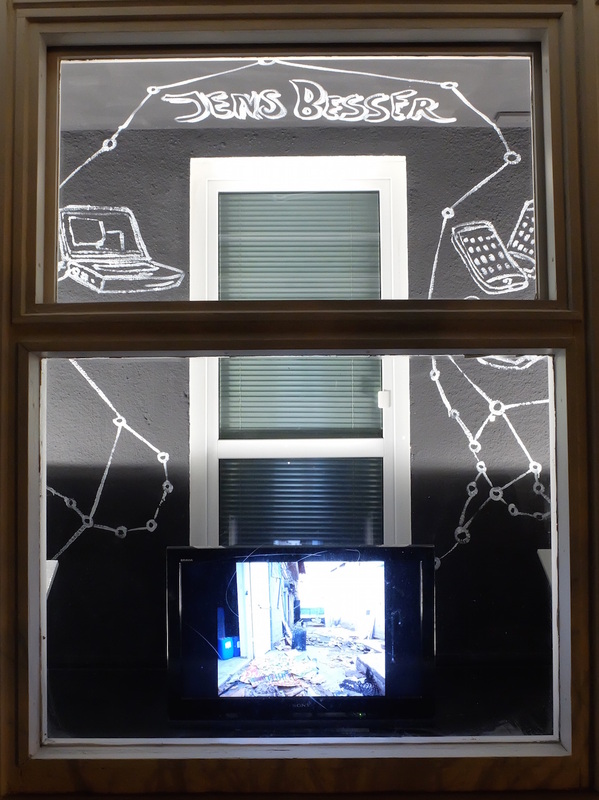 2011 Besser started to curate the public gallery „RAUM City Bilder“ in cooperation with riesa efau. 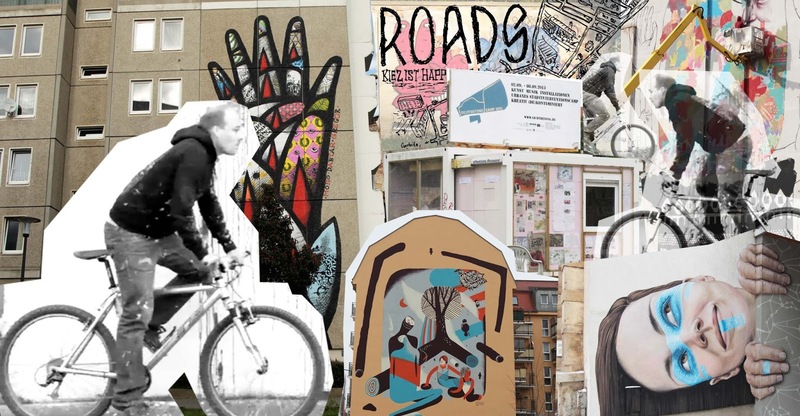 The urban art bicycle tour invites to discover the prospering urban district of Fröbtau. The tour is part of Roads Festival . Start 14.10.2017 - 2p.m. - riesa efau /Adlergasse Crossing Wachsbeichstraße / Dresden - "Fröbtau"
Duration of the tour is 2 hours. Please bring your bicycle. 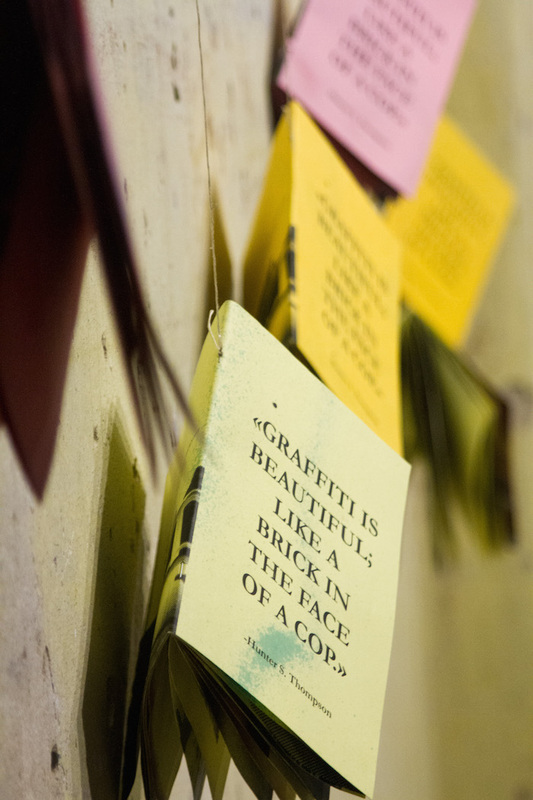 The collaborative show "Accomplices Across Borders - Walls,Trains & Vagabonds" opened on 5th May at Hole of Fame Dresden. worked together on a limited edition magazine. 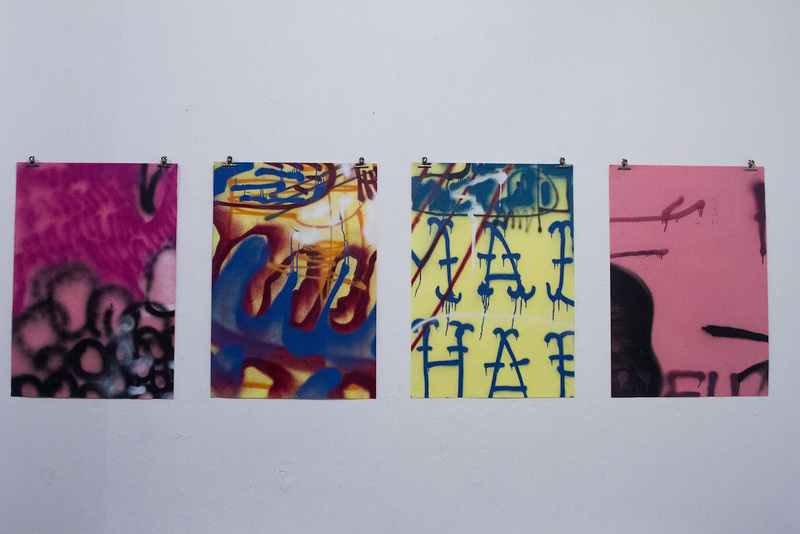 The content, texts and photos of the collaborative process, is screen printed on 100 sprayed papers. 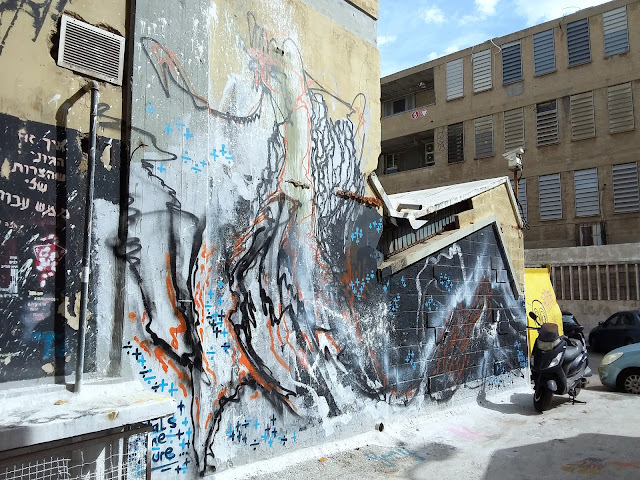 Papers were sprayed outdoors on various public surfaces by the participating visual artists. The limited DIY magazine is available for 5€ cash at Hole of Fame Dresden. The Show runs till 28th May. In April I'm invited for a solo show at TEGN: Art-space in Jyderup/DK. The space is located in a town with only 4000 inhabitants. 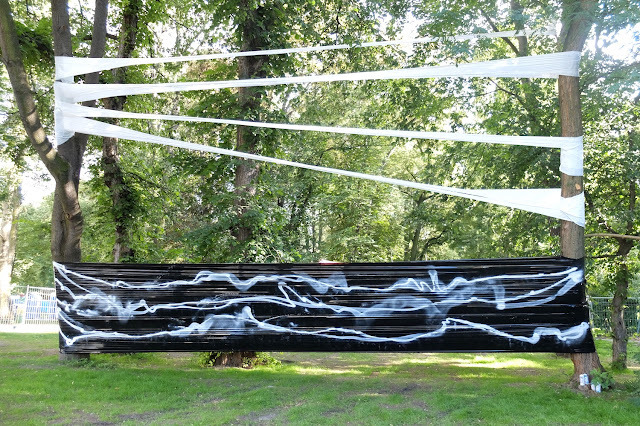 It will be really interesting to present my works in the countryside area of Denmark, because my works are usually much connected to urbanism and metropolitain chaos. At least Jyderup has a train line including a station. The show starts on 28th April. 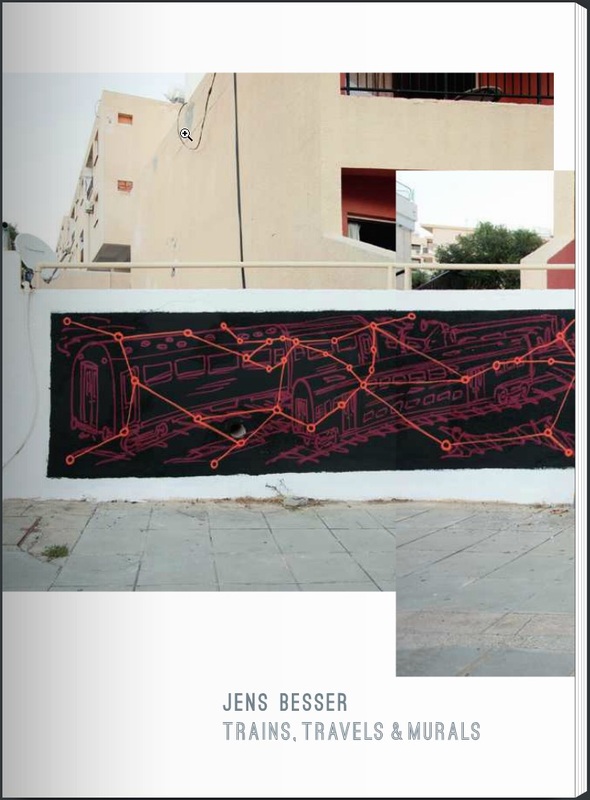 On the same day i present my catalogue "Trains , Travels & Murals". Thanx a lot for the invitation to Anders Reventlov. 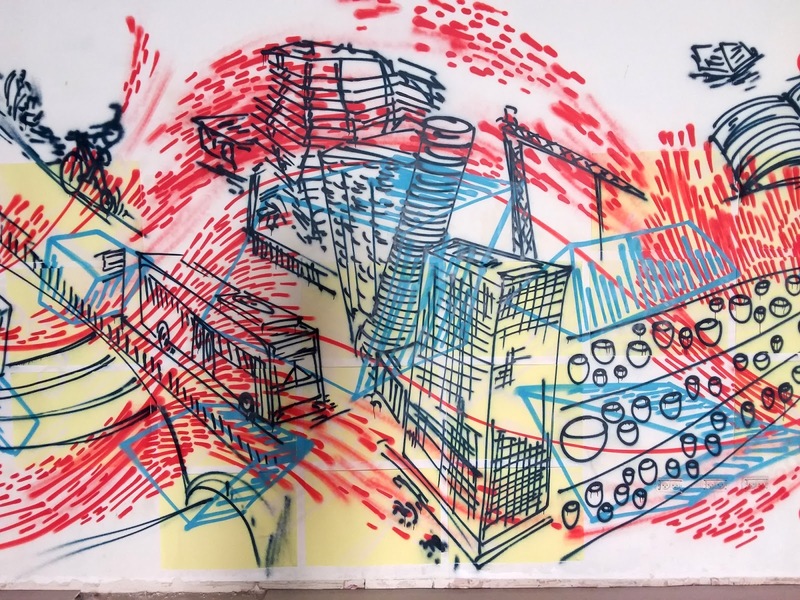 Magic City, one of the biggest urban art shows in Europe, moves to the next exhibition hall. After the start in Dresden Magic City now stops in Munich till September, before moving on to Stockholm in November. 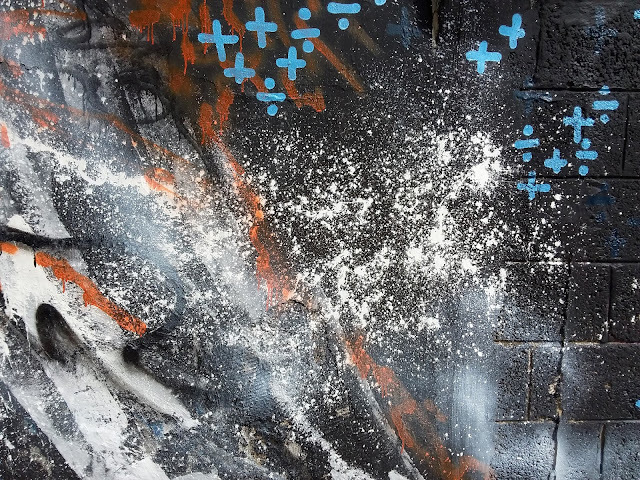 The Munich show starts on 13th April - again with my work and a lot new works such as Blek le Rat or Niels Shoe Meulman. The whole artists line up you can find here. In Munich they will present the accompanying catalogue - I'm curious to see it! Yesterday i started to work on a new drawing for the University Hospital Carl Gustav Carus in Dresden. 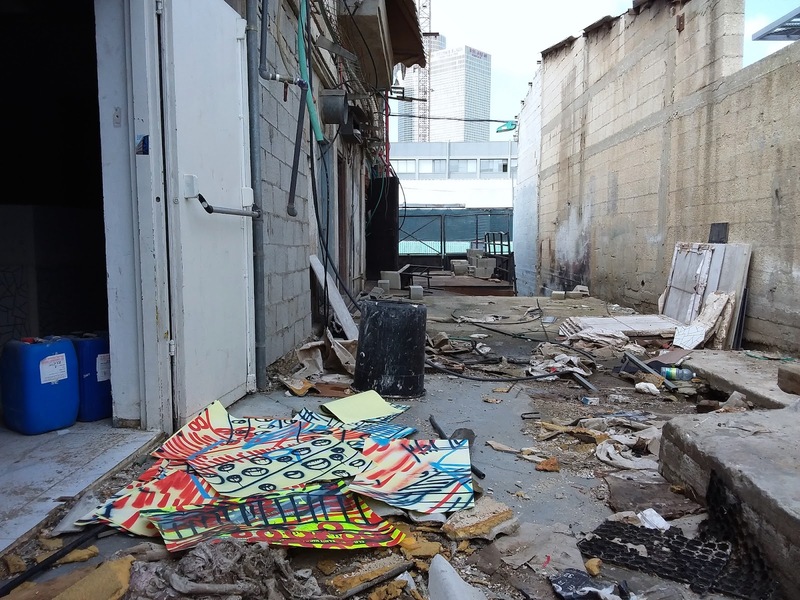 The work is located in the backyard of the child psychatry. It's a smaller commission, but i shows well how the painting of an ugly brownish metal shed can change the backyard situation a lot. More pictures coming soon. This is a mural painted in Dresden-Prohlis without sketch. Painted like a street bombing piece. 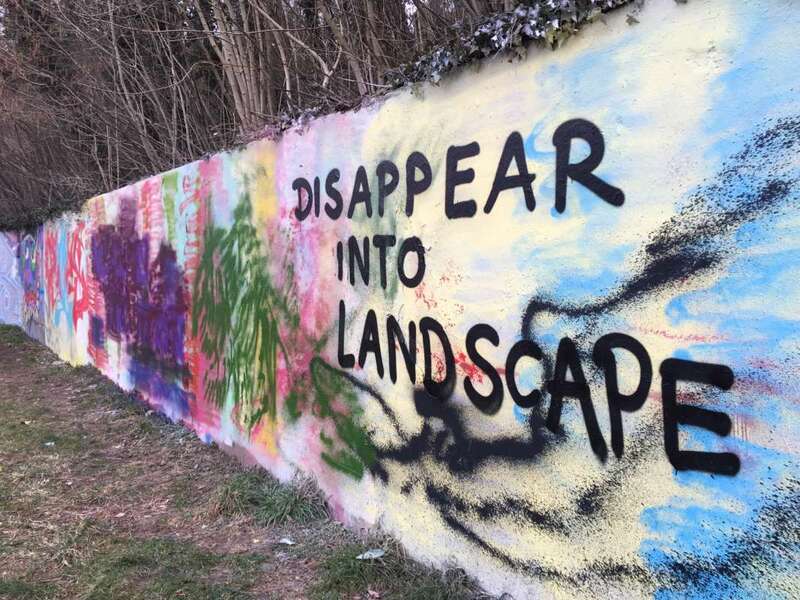 And while you paint you get an idea what it deals with. This one is about panel and T2B sized works on trains - compared to a wall. During the LackStreicheKleber - Festival 2016 I painted some works at Groove Station Dresden. 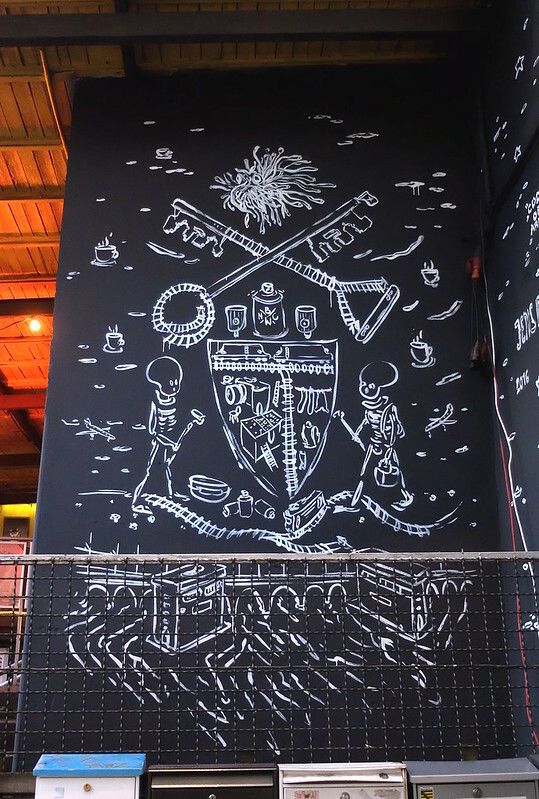 This one shows the flying spaghetti monster above the arms of an unknown priests group. 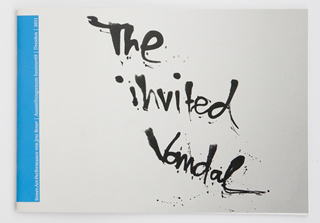 The catalogue "the invited vandal" of my 2011 solo show is now online available.